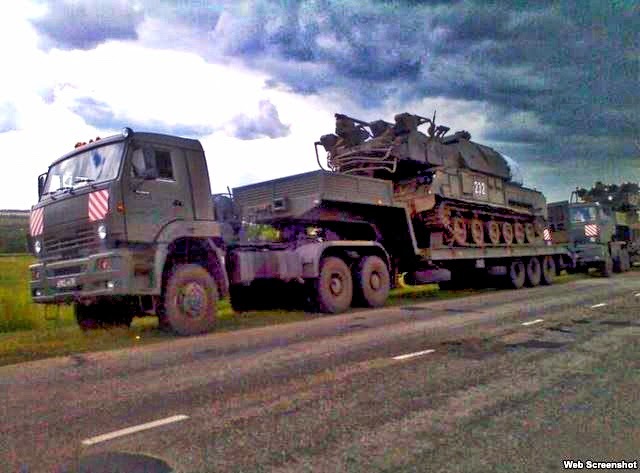 KIEV, Ukraine -- More and more evidence is emerging that seems to document a large Russian military convoy that traveled to eastern Ukraine in June 2014 and brought Buk antiaircraft systems to Russia-backed separatists fighting against Kiev. The photograph above, shows a Buk system with the identifying number 232. The same Buk bearing the same number was photographed in the Russian town of Stary Oskol, not far from the Ukrainian border. In an Instagram post from June 2014, a user identified as "rokersson" said the Buk was part of a convoy of 80 to 100 vehicles moving toward Ukraine. On May 13, a group of pro-Ukrainian citizen activists published a report purportedly identifying a Russian soldier who was a driver in that convoy and showing photographs of Buk systems apparently being escorted across Russia to Ukraine. A few weeks later -- on July 17, 2014 -- Malaysia Airlines Flight MH17 was shot down over Ukraine's Donetsk region. Although the investigation into the MH17 downing is ongoing, many believe the aircraft was shot down by the separatists using a Russian-provided Buk system. The separatists and Russia have blamed Kiev for the downing of MH17, and Moscow denies providing Buks -- or any other weapons -- to the separatists. However, the activist group InformNapalm has found photographs on the VKontakte page of a Russian soldier named Dmitry Zubov that seem to detail the convoy's June 2014 journey. According to Zubov's posts on VKontakte -- his account on the Russian social-media site has subsequently been closed down, but InformNapalm saved cached copies -- he was serving with the 147th Automotive Logistic Support Battalion, Unit 83466, based just outside of Moscow. At the time, he was serving his last few days before being demobilized. Some of his photos show the convoy as it crosses Russia and the soldiers who were traveling with it. An additional photo shows Zubov on a train returning to his unit in Russia, where he was demobilized a few days later. Eliot Higgins is the founder of the citizen's journalism website Bellingcat, which occasionally cooperates with investigators from InformNapalm. He said the information released by InformNapalm jibes well with Bellingcat's own probes into the convoy that allegedly brought the Buk systems to eastern Ukraine, including the one he believes was used to shoot down MH17. "We've been looking at this same convoy and there's quite a lot of interesting information," Higgins told RFE/RL. "InformNapalm has found one piece, one profile. We've found much, much more additional material. We've got the names of the people who were in the convoy. We've got a good idea of which vehicles they were driving. In fact, the guy who they feature in the article was actually almost certainly driving just one vehicle in front of the actual missile launcher that [we believe] shot down MH17." "There was a big, massive movement of equipment between June 23 and June 25, including the missile launcher that shot down MH17, and a few weeks later we see it in Ukraine on July 17," Higgins said. Bellingcat has been sharing its findings with investigators in the Netherlands who are looking into the downing of MH17 and plans to issue its own report on the convoy on May 28. The InformNapalm information comes one day after the release of a report based on research by slain Russian opposition politician Boris Nemtsov documenting Russia's alleged involvement in the conflict in Ukraine. The Nemtsov report also makes extensive use of social media to document its claims that Russian soldiers and Russian-paid mercenaries have been fighting with the separatists. Chapter Eight of that report argues that MH17 was shot down by separatists using a Buk antiaircraft system.